Police want to identify three people after violence between rival fans at a Bangor City v Caernarfon Town football match. The Gwynedd clubs met in the fourth round of the Welsh Cup on 26 January. 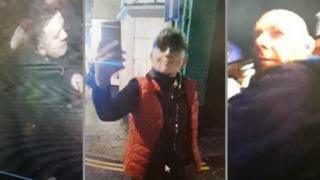 North Wales Police has released images of a woman and two men it wants to speak to about a public order incident on Holyhead Road. In another disturbance, a police officer was taken to hospital following an altercation between fans. Police in Bangor tweeted that other officers had been injured, kicked or spat on, in the town after the game.